Create playful light displays with the prettiest hue! Pink Christmas lights are bold, bright and exciting. Decorate with all pink lights or pair them with other light colors in a variety of settings indoors and out. C7 & C9 pink lights are great for lining the roof and walkways during Christmas and can be hung above outdoor spaces or along a fence in the spring and summer as a fun alternative to patio lights. Pink mini lights add a pop of color to wreaths, garlands and Christmas mantel displays. Wrap trees, columns and stair railings with pink mini lights too! Decorate with pink Christmas lights for baby showers, weddings, holidays and events or to show your support for an important cause. There are so many ways and opportunities to decorate with pink lights! We've placed a few of our favorite ideas below to inspire your next lighting adventure. 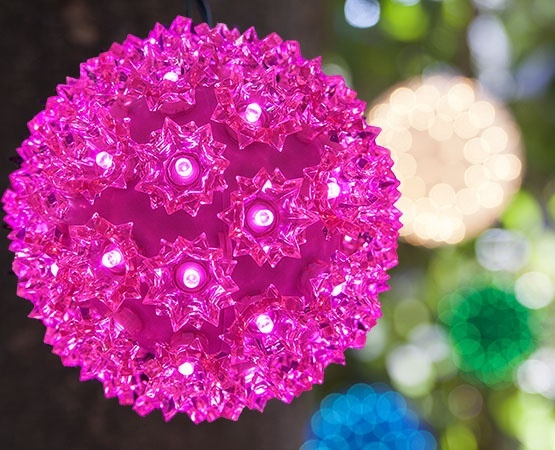 Hang pink starlight spheres from tree branches at an outdoor wedding, party or event. Brighten a wedding shower or bachelorette party with pink lights and mix in other colors like purple and white for even brighter illumination!